Montessori Numbers is designed to help build sound mathematical foundations in children aged 3-7 by using a concrete, visually significant material inspired from the Montessori methodology. I love the visual association they used in the app: for 100, it is a 10×10 square; for ten, it is a rod with 10 units sticked together. We used a toy called “Big Ten” when my son started learning numbers, it had similar visuals, and it helped him greatly in understanding the real meaning of the numbers. 1 to 20: This activity is designed to introduce numbers. There are 3 levels of difficulty: 0 to 5, 0 to 10 and 11 to 20. Quantity: Kids associate visual quantities to numbers by manipulating units, bars of 10, and squares of 100 to match a given number which is pronounced and optionally displayed. 3 levels of difficulty: 0 to 9, 10 to 99 and 100 to 999. Numerals: Kids associate number names to numerals. As a number name is pronounced, kids are invited to build the corresponding numeral. Kids can freely experiment with numerals and hear the names associated with each numeral they build. The quantity representing the numbers built is also displayed to reinforce the association between quantity and numerals. 3 levels of difficulty: 0 to 9, 10 to 99 and 100 to 999. Numerals (from Quantity): Kids build the numeral to match the quantity displayed. This is the most complex activity because the child must count the quantity displayed, and then build the number using the numerals. 3 levels of difficulty: 0 to 9, 10 to 99 and 100 to 999. Building Block Game: A game appears at the end of each activity. Kids can play freely with the materials they used in the activity and build whatever they want. Number Tracing: Learn to trace numbers with animations that follow the child’s touch. 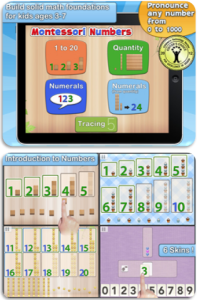 Montessori Numbers works on iPhone, iPod and iPAD. It is $2.99 on App Store. This sounds like a great learning app for little kids! I wanted to download this for my grandkids, but it’s showing that it costs $2.99. yes, I checked too. The price is up now. Thank you for this one! It is perfect for my daughter right now who is LOVING numbers! What a great way to encourage and develop that. I adore montessori.